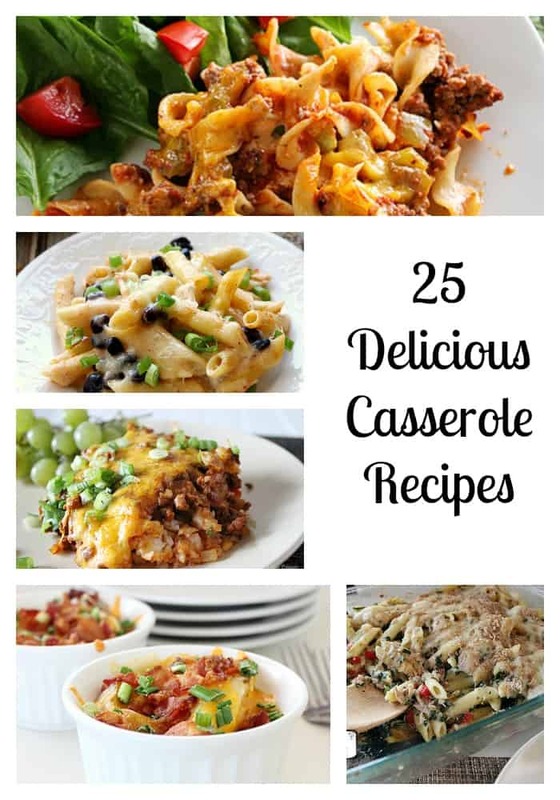 Anyway, I’ve compiled a roundup of some really yummy casserole dishes that you should give a try this winter…even the tuna noodle looks great, and I’m definitely not a tuna noodle kind of girl! Let me know what you think and add your own in the comments if you want to share! Breakfast Egg & Bacon Casserole Freezer Meal – Eggs, bacon, cheese, and even spinach combined for a make ahead hearty breakfast your family will love. Oatmeal Breakfast Casserole – This one would be great for large families. Nutritious and a perfect start to a school day! Baked Potato Casserole – Picture a loaded baked potato in a casserole. Delicious! Best Ever Sweet Potato Casserole – You’ll never look at sweet potatoes the same after you’ve had them in a casserole with apples. Twice Baked Potato Casserole – All the cheesy goodness of a twice baked potato in a casserole. Easy and Delicious Cheesy Holiday Hashbrown Casserole – Not just for holidays. This casserole would make a tasty side dish to just about any meat you serve. Pork Sausage Casserole – Ingredients for this one include long grain wild rice, mushrooms, and sausage. If you don’t like sausage, another meat would work well as a substitution. Ham Casserole – This recipe is a smart way to turn leftover ham into a second meal. Not Yo Mama’s Tuna Noodle Casserole – Classic tuna casserole gets a makeover. Your family will actually want to eat this one! Shrimp and Grits Casserole – This is a less spicy version of traditional shrimp and grits, and there are some great tips to cooking grits in there too if you’re unfamiliar with them. Hamburger Pie – If you forgot to prep dinner before work, this is a quick and easy hearty meal You can also change a few things up to make it a little more homemade. Try adding some corn or peas to it to make a complete one pot meal! Hashbrown Hamburger Casserole with Veggies and Cheese – Hashbrowns make this casserole different. It also uses 2 cups of mixed vegetables, so you can be sure that there is a lot of nutrition in this as well. Beefy Sour Cream Noodle Bake – Sour cream, cream cheese, and cheddar transform ground beef and egg noodles into something fabulous. Sloppy Joe Casserole Recipe – Awesome alternative for those who love sloppy joes but hate the mess they make when on a bun. Now they are officially fork-worthy. Fiesta Ranch Chicken Pasta Bake – Chicken and pasta with a cool ranch kick make this an awesome weeknight dinner option. Hot Chicken Salad – It’s chicken salad taken to the next level by baking it with cheese and potato chips! Great for a lunch dish served hot or at room temperature. Curried Chicken and Rice Casserole – Comfort food turned healthy. If your family isn’t fond of curry you can also substitute oregano or basil for a more Italian flavor. Creamy Chicken Broccoli Pasta – Chicken, Broccoli, and cheese? Yes please. This simple recipe will probably become a staple in your menu. Turkey Enchilada Bake – Three layers of turkey enchilada goodness made even better when it’s topped with lime and avocado. This recipe is beautiful and packed with nutritional value. Tamale Pie – An interesting recipe that takes tamale ingredients and tops them with cornbread. Cheesy Burrito Casserole – Burrito ingredients in a casserole. The Ultimate Wet Burrito – If you love Mexican food you will love this! Complete with everything you’d ever want in an enchilada. It’s a spicy one but you can tone it down by using mild salsa and omitting the jalapeno peppers. Easy Baked Penne – This simple to make baking dish full of deliciousness will feed quite a few. Pizza Spaghetti – Two favorite foods combined. How can you go wrong? Customize to your family by mixing in some of your favorite pizza toppings – mushrooms, peppers, onions…the sky’s the limit! Thanks for sharing my Sweet Potato and Apple Casserole! Great roundup! You’re very welcome! Thank you for sharing it with us! Hearty casseroles are always good.